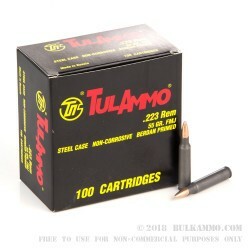 Tula is a great option for cheap outdoor range day ammo, if you have no intention of reloading your spent casings. This ammunition come loaded using non-corrosive Berdan primers and non-reloadable steel casings. These steel casings are much cheaper than brass, which means that this ammunition is cheaper than the brass cased stuff. This ammo is also loaded with 55 grain FMJ bullets, which is the most popular grain weight on the civilian market. 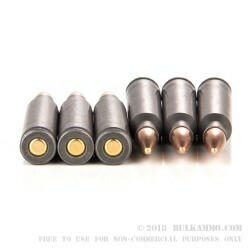 These bullets may be either zinc or copper plated. Tula started using zinc instead of copper to plate their bullet in 2015, to cut cost and to improve performance. You will know if you got the zinc plated bullets, because it will look like Tula forgot to plate the bullets. Tula Ammo is manufactured in Russia, using strict but affordable methods to provide customers with a reliable product. No problems to report at all !! Fast shipping, Good shooting, a real bargain. Like I said "I will buy it again" & from Bulk Ammo. I have purchesed 1500 rounds of this so far, and so far, 0 problems out of 500 rounds. For anyone having problems with this ammo, make sure your gus is clean and well lubricated. Out of a delton upper on a stag lower i am holding a 3.5" group at 100 yards. Thats good enough in my book. Dont be afraid to run steel. 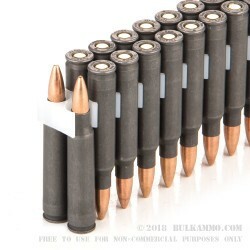 Anyone who says its crap ammo either A. Has a problem with their gun, or B. Needs more lubrication. With all that said, bulkammo is a pleasure to deal with, will definitely be prdering from them from now on. Q: Is the case coated with anything? A: Hello Chris! Tulammo use a polymer coating on all of their steel cases. A: Hello Ryan, These 55gr. FMJ rounds by Tula in .223 have a lead core, but Tula does sometimes use a bi-metal jacket and they do have a steel case which are both magnetic. For a non-magnetic round, I would suggest a brass cased round.